Glasgow Montrose. A Chess Club in the city centre of Glasgow. Meets Thursdays, 7.30pm, The Minerva Club, 59 Burnbank Terrace, Glasgow G20 6UQ (Google Maps). Glasgow Montrose Chess Club is based in the West End of Glasgow. Apologies to anyone who reached this site by checking out ‘chess in Montrose’ on a search engine, but the club has been called by this name since its foundation in September 1965 in 23 Montrose Street, Glasgow. Nowadays this area is dominated by Strathclyde University. Back then though, in a small, dusty room in the Glasgow Health Centre, every Thursday evening a group of men would meet and quietly develop the dream that is G.M.C.C. Members of Glasgow Montrose have been, for many years now, active in managing, and organising chess events in Glasgow and the West of Scotland. Currently there are 3 members on the GCL Management Committee (Chris Perkin, Sam Collins, and John Dempsey) and 2 directors on the Chess Scotland Management board (Sam, and John). Also two of the Glasgow Congress Committee are from Montrose, and two other members are sponsors of this years Congress.The club also has a former president of the Glasgow Chess League, David Reid. In addition to our 2 teams playing in the Glasgow Chess League, we also run a team in the Dumbarton League. Within the club itself, we have an annual Club Championship and quickplay tournaments, as well as loads of knockabout games; there is never a shortage of people to play either as we are a fairly large club and we’ve got players of all levels. You don’t have to be from the West End either, we have players from all over Glasgow and around. Thanks to the sadly departed* Luke Barker for the original copy for this page. 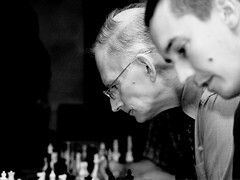 Photo: Norman and Graeme ponder hard during the simultaneous exhibition vs. Grandmaster Artur Yusupov held on Sept. 28th, 2006. Click to view larger (flickr.com). *…to Phones Chess Club, that is!